"...blurring the line between reality and myth, between the power of everyday and the power of imagination..."
Paul recalls ‘thinking in pictures’ for as long as he can remember. When he ventured into children’s book publishing, his eyes were opened to the “rich and multi-layered world of illustration and magic”. 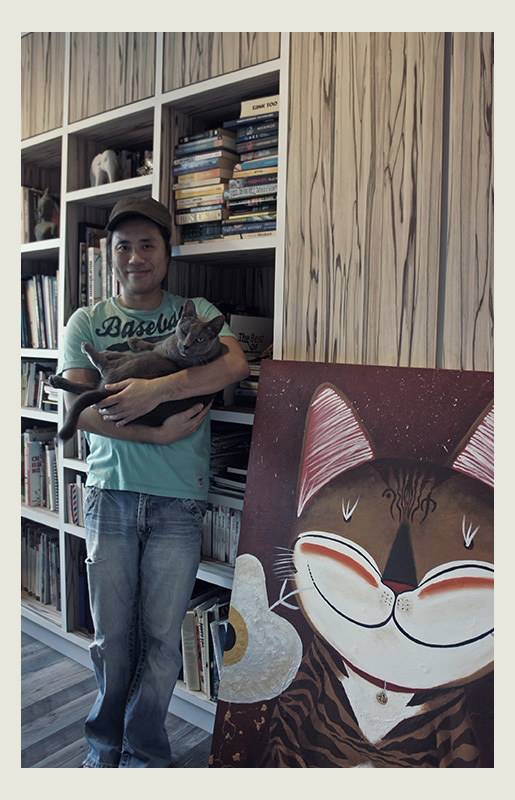 Inspired and excited, he ventured into illustration, and subsequently into digital design. 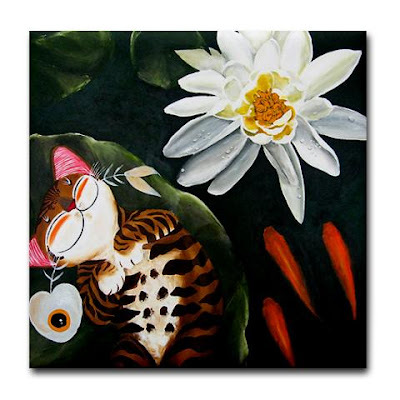 Painted in acrylics on canvas, the catmaSutra series embodies Paul’s signature style and has attained iconic status in the local arts scene. We couldn’t resist asking – why cats? Paul also encourages collectors to listen less to what policymakers and critics say, and more to how each piece of art speaks directly to them. “Perceptions of what is ‘valuable’ art are affected by boards and committees who decide on grants and funding, inclusion in national or international art fairs, and which pieces of public art is commissioned. However, a piece of art has value insofar as there are people who are willing to believe in the artists,” said Paul. The beauty of Paul’s work is that it is accessible, in more ways than one. 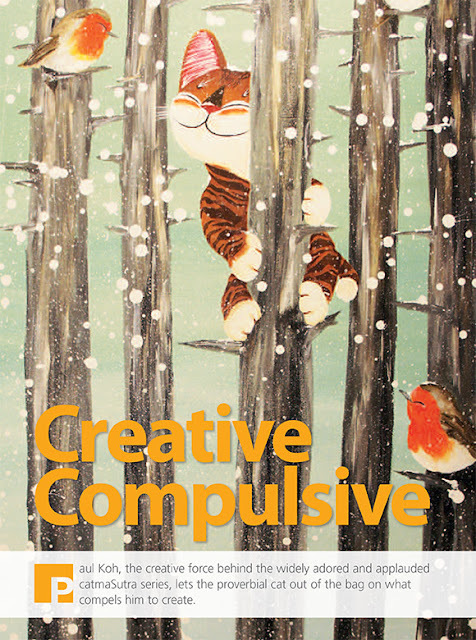 He holds an exhibition at Utterly Art in December every year, and also works with a local company, Arts2U, which helps to promote local artists through merchandise such as puzzles, post cards, coasters and so on. 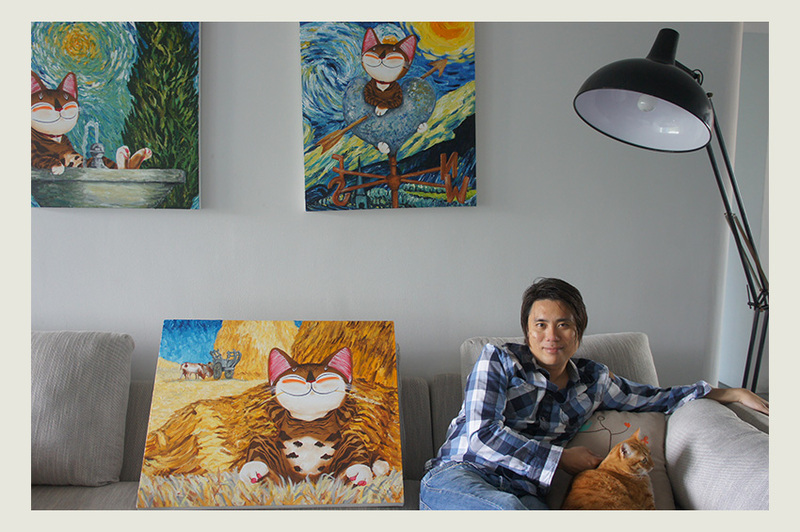 His art collectables are carried in most museum shops in Singapore, including the Esplanade Shop, Red Dot Museum, SAM and Banyan Tree Gallery. 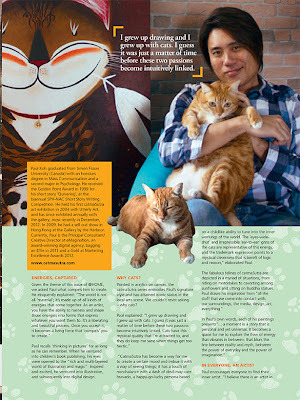 He also accepts commissions for portraits of cats, dogs, rabbits… anything with fur, from what we can gather! Kawasaki, Amy Sol, Mark Ryden, Marion Peck, James Jean, Yuko Shimizu – as well as the masters such as Seurat, Monet, Magritte, Klimt, Van Gogh, Hokusai… are all inspiring!” he enthused. Paul encourages every homeowner to invest in art. ”I think that every home should have a piece of art that matches the personality as well as captures the imagination of its owner. Art can transform a house, bringing with it an energy that might otherwise be lacking. It should complement its occupants, and provide a ‘space’ for them to reflect, refresh or simply recharge,” suggested Paul. Paul’s current home has a loft-like look with concrete floors, several brick walls,and glass partitions. The walls are painted in light grey and graced with many catmaSutra’s ‘ear-to-ear grin’ paintings. Though Paul describes it as “a happy and quirky place”, he was quick to describe his dream house. Do as Paul does – dream a little dream house for yourself. And be sure to reserve a place on a wall for a special piece of art. 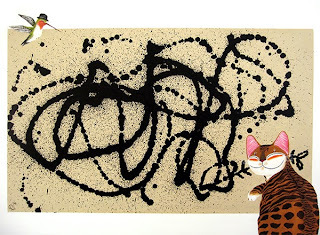 A catmaSutra paw-trait could be just purrfect! But if not now, then when?